Posted on November 11, 2018 by Lea S.
At the precise moment this post is going live, it is 11 a.m. in Belgium and France. This marks 100 years to the minute since World War I’s official ceasefire took effect at 11 a.m., November 11, 1918. After years of constant gunshots and shellfire, the final shots rang out in the same place they began–in Mons, Belgium. The last soldier to fall was American private Henry Gunther, who was killed by automatic fire in the village of Chaumont-devant-Damvillers, France, at 10:59 a.m. Soldiers celebrating the end of fighting. Millions had died from 1914 to 1918–far too many for our minds to comprehend, try though we might. And millions more died when the Spanish flu epidemic swept across the globe in 1918. But on that first Armistice Day, everyone allowed themselves to rejoice–to rejoice in the bloody struggle’s end, and perhaps to rejoice in life itself, fleeting as it was. A jubilant crowd in Britain. If it’s hard for us to grasp the scale of death during World War I, it might also be hard for us to grasp the frenzy of joy that took place when the ceasefire was declared. In cities around the world, cheering crowds poured into the streets. People climbed up light posts and statues and stood on top of cars. In small towns, houses emptied as everyone ran to dance in the streets and march in impromptu parades. Bands played, banners and flags waved. In factories, in shipyards, even on trains, everyone stopped what they were doing to shout and cry and celebrate together. Crowds packing the avenues of New York City. Parades through the small town of Bemidji, MN. A vast throng in front of Buckingham Palace. Every Veterans’ Day is important, but today has a special resonance. 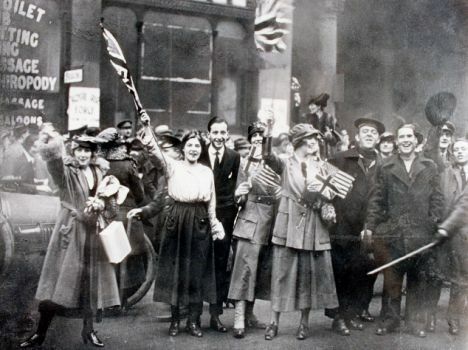 Wherever you are, and whatever you may be doing today, please take a moment to remember the immense sacrifices made by so many millions of people–and to remember the wild, fierce, joyful celebration of life that took place in the streets of our cities and hometowns 100 years ago. This entry was posted in History, Milestones and tagged 1910s, 1918, Armistice Day, The Great War, WWI, WWI centennial by Lea S.. Bookmark the permalink. This is an event that we should never forget. We don’t honour the war(it was nothing more than pointless and senseless mass slaughter)but we honour those who lost their lives. We honour those who performed heroic acts to save and help others. We honour their lives and memories. Absolutely–I couldn’t have put it better myself, Maddy. The terrible sacrifices they went through–in a bloody struggle that has ramifications even today–must not be forgotten. And now I’m crying. That just isn’t fair. It’s mind-boggling to think about the war-all that senseless slaughter for what Wilfred Owen called the old lie. Yes, it’s bizarre. Apparently thousands of men died the morning of Armistice Day, before the official ceasefire was declared–when the higher ups knew the ceasefire was coming, too. Henry Gunther’s story is an unusual one all around. Apparently he was demoted from sergeant to private at one point, and became obsessed with the idea that he had to prove himself to his superiors. When the ceasefire was only minutes away, he decided to charge some nearby Germans, even as they were trying to wave him off. But he kept charging and firing, and the automatic fire claimed his life. There was another soldier who was British or French (can’t recall his name) who died at 10:58 a.m., after being spotted by an enemy while he was patrolling some houses. That was a very sad story too–he just happened to be in range of someone bitter enough to take him down in those final moments. Weird that the last soldier to fall was named Gunther, probably no relation, but the same surname as my grandfather, George Gunther, of whom I shared some (probably too much!) info with you about his silent film extra bit parts. George was 38 when the U.S. joined the war. He volunteered for the Army National Guard for home defense. There was actually a concern during the war that we would be invaded at home. He did not have to go through those horrors at the front overseas, but he did his part. I salute your grandfather for his service, Brett! I have a number of veterans in my family tree, myself. So many, many people back then dropped everything to go and serve their countries, in whatever way they could. It’s remarkable, and worthy of remembrance. What a lovely post (like all your posts). I still get choked up when watching the final minute of the original “All Quiet on the Western Front” — not a silent, of course, but the silence of the final minute (minus the gunshot) is what makes it especially moving for me. That is one of the great, heartbreaking moments in cinema, no doubt about it.